A woman who police say was being held hostage by her knife-wielding boyfriend, along with her three children, used the only method of communication she had available to ask for help: She added “911hostage help!” and “Please Help. 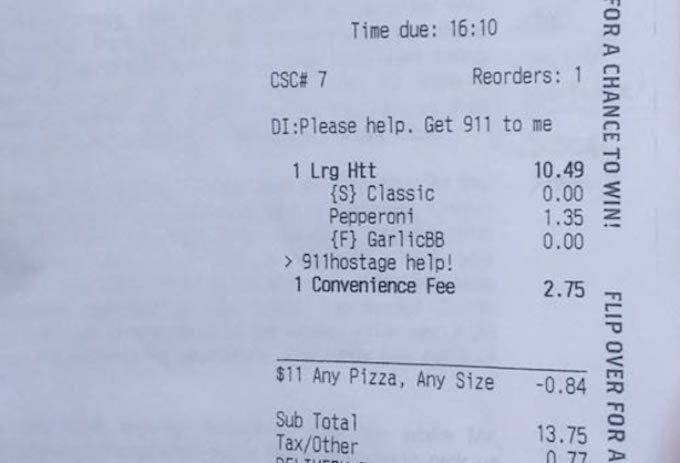 Get 911 to me” to her online Pizza Hut order. Investigators in the sheriff’s office say the message came in on Monday afternoon with an online order for a small hand-tossed classic pizza with pepperoni, reports WFLA.com. And included in the comments/special instructions area where most people ask for a side of ranch dressing, workers at the restaurant that received the order found the apparent pleas for help. Pizza Hut workers realized the order was from a frequent customer, making the comments out of the ordinary, so they called the police. Police responded to the delivery location and found the woman holding one of her kids. She said her boyfriend was home and armed with a knife, along with all three of her children. She was escorted to safety with the one child in her arms, while the cops spoke to the boyfriend through a closed door, who was reportedly reluctant to leave. “His first words were, of course, ‘I’m not coming out because I know I’m going to jail,’” one of the officers on the scene said. Police managed to talk him into coming out after 20 minutes, and removed the other two children from the home unharmed. According to the police report, the boyfriend might have been high on methamphetamine, and the couple had been fighting during the day. When she’d left the home to pick the kids up from school, he’d reportedly taken her phone and gone with her. Once home, she convinced him to let her order a pizza on the smartphone, which is when she took the opportunity to send the secret messages. He was arrested and charged with aggravated assault with a weapon without intent to kill, battery, false imprisonment and obstructing justice by depriving communication to law enforcement. Police are now crediting the woman’s quick-thinking in sending a message for help, and the restaurant for reporting it.